Could CO2 have lowered the rate of natural warming in the oceans? As a minor followup to my post “Could CO2 have lowered the rate of natural warming?” lets consider ocean warming. 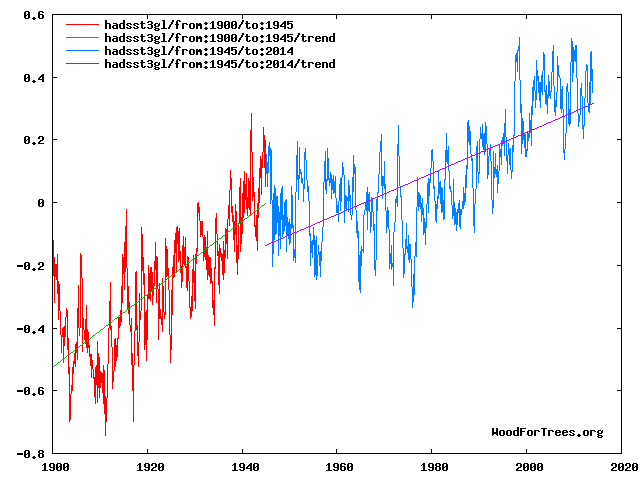 From 1900 to 1945 oceans were warming at a rate of 0.0116188C per year. After 1945 oceans were warming at a rate of 0.00654978C per year. Which means the massive 1945 increase in CO2 after 1945 slowed the rate of ocean warming by 0.00506902C per year. Which is a drop off 44%.